Rose Day 2018 orders are soon open. Check back soon. Recognize a women in your life with a yellow rose. Rose Day 2018 is March 8, 2018. 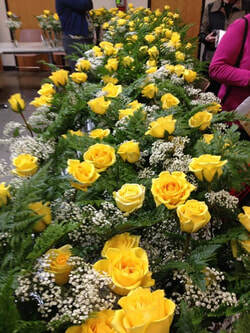 Place your order today for a yellow rose from Zonta Club of Fort Collins to recognize a women in your life. ​Deadline for orders is FEB 20, 2018. Mark your calendar for March, 2018 the Zonta Club of Fort Collins Yellow Rose Day for recognizing women. Join us as we recognize women and high school young women each year with a long stemmed yellow rose and kind words of recognition shared by someone close to them. The Zonta Club of Fort Collins sells the rose for $10.00 if cash or check (credit card small transaction fee added). There are two options for your order, see links above. You provide the reason for the recognition, and we fill in the postcard attached to the rose. The best part is when Zonta members drive all over Fort Collins on March 6th delivering a yellow rose to an unsuspecting woman making her day brighter. What a good feeling to give a gift of a yellow rose to other women this day. If you have questions email us at zontafortcollins@gmail.com. We begin taking orders in FEB so think of someone you would like to recognize and place your order today. High School Young Women Recognition, MAR 2015 and 2016, was held at both Poudre High School and Rocky Mountain High School for the third year. We recognize (4) four young women at each high school who have passion for giving back in their community especially to young girls. These young women are recognized at a special event at each school during this month with a yellow rose, a certificate of recognition and reading their stories from their teachers as to why they were nominated for this special recognition. Their pictures will also be submitted to the Coloradoan for publication with their recognition honored. We salute these young women! Check our gallery for pictures. This special recognition will occur again MAR 2018 in at each high school. International Women’s Day (IWD) is a globally-recognized day which celebrates the economic, social and cultural contributions made by women. It is is observed each year on March 8th. It is a day when women are recognized for their achievements without regard to divisions, whether national, ethnic, linguistic, cultural, economic or political. It is an occasion for looking back on past struggles and accomplishments, and more importantly, for looking ahead to the untapped potential and opportunities that await future generations of women. In 1975, during International Women's Year, the United Nations began celebrating International Women's Day on 8 March. Two years later, in December 1977, the General Assembly adopted a resolution proclaiming a United Nations Day for Women's Rights and International Peace to be observed on any day of the year by Member States, in accordance with their historical and national traditions. In adopting its resolution, the General Assembly recognized the role of women in peace efforts and development and urged an end to discrimination and an increase of support for women's full and equal participation. The UN and Gender Equality The Charter of the United Nations, signed in 1945, was the first international agreement to affirm the principle of equality between women and men. Since then, the UN has helped create a historic legacy of internationally-agreed strategies, standards, programmes and goals to advance the status of women worldwide. The beginnings of IWD can be traced back to the Women’s Rights Movement in the late 1890s from the activities of labor movements in North America and across Europe. IWD became formally recognized by the United Nations during International Women’s Year in 1975. Then in December 1977, the UN General Assembly adopted a resolution proclaiming March 8th as a day for Women’s Rights and International Peace. Annually on 8 March, thousands of events are held throughout the world to inspire women and celebrate achievements. The United States even designates the whole month of March as 'Women's History Month'. So make a difference, think globally and act locally !! Make everyday International Women's Day. Do your bit to ensure that the future for women and girls is bright, equal, safe and rewarding. Rose Day 2015 225 roses delivered to unsuspecting women being recognized by a family member, friend or colleague for International Women's Day. What a fun day for Zontians. 2015 UN Theme: "Empowering Women, Empowering Humanity: Picture It: ‘Make It Happen’. This event is Celebrated globally on 8 March, International Women's Day.